Despite the name, peanuts are not nuts, they are legumes and come from the same family as beans. Yup, I guess I just made a bean martini. Honestly, this isn't a recipe as much as it is a way to enjoy a very special liqueur called Castries Peanut Rum Creme. 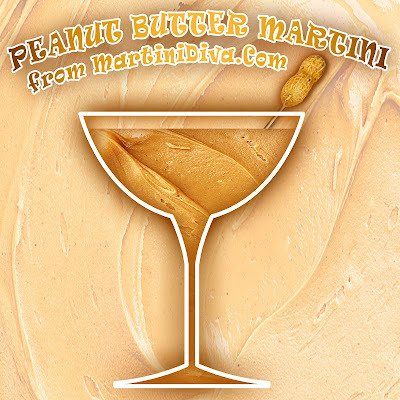 This special liqueur is just like sipping creamy, liquid peanuts! All I did here was add just a pinch of salt. Pipe a small line of peanut butter on the edge of the glass rim then dip in the crushed peanuts. Chill glass in the freezer. Shake ingredients in a cocktail shaker until chilled. Pour into the chilled, rimmed glass and serve. In 1884 to Marcellus Gilmore Edson of Montreal, Quebec, Canada patented a process of milling roasted peanuts between heated surfaces until the peanuts entered "a fluid or semi-fluid state", and in 1903 Dr. Ambrose Straub of St. Louis patented a peanut butter-making machine. But peanut butter or peanut pastes had been around hundreds of years prior to both of these inventions. The ancient Incas used peanuts and were known to have made it into a paste-like substance centuries ago, though this was not the creamy substance we're familiar with today as it did not include the oils or sugars that are added in modern peanut butters. Peanut Butter is an excellent source of iron, magnesium, potassium, copper and calcium. Though Peanut Butter is high in fat it is monounsaturated, which has been shown to improve the cholesterol profile by lowering "bad" LDL cholesterol. According to the Journal of Neurology, Neurosurgery and Psychiatry, the niacin contained in peanuts, when eaten regularly, provides protection against Alzheimer's disease.